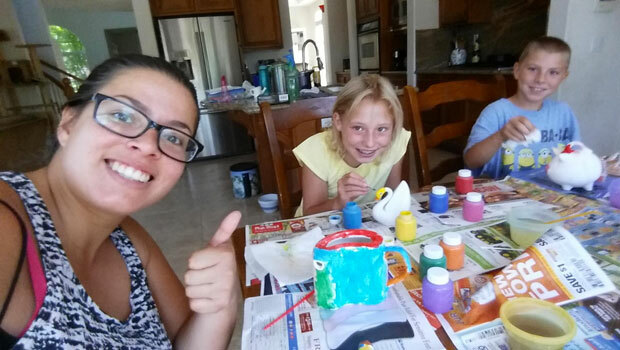 Suzanne from the Netherlands is an au pair in California, USA. The key to the best arts and crafts experiences is to not limit the child’s imagination. It’s more fun for them, for you, and for their parents if you don’t follow the directions of art projects perfectly. Everyone will have more fun! Less adult intervention will result in a more exciting and enriching art experience for the child. Include crayons, markers, colored pencils, paints and brushes, paper, glitter, child-friendly scissors, and little pieces of material that could be recycled in an art project. Be sure to include a drop cloth and smock. Set up this collection in a place where your kids can easily reach it so they can make projects without too much adult supervision. Even making an art box can be an activity that engages the kids. Decorate a large shoebox or something similar, and turn the box into a spaceship, animal, or house! After putting together an art box, talk with your host family about where a good art center/area would be in the house. After you pick a place that is easily accessible for your kids to create on their own, make sure to use plastic or newspapers to protect carpet, wood floors, or any fabric that could get messy from little hands! Have all materials on hand before an art project starts. Designate an area where any wet materials will be able to dry undisturbed. And the most important aspect of any art project: you! Kids love it when an adult will participate with them in art projects. After the art project is complete, remember to praise the finished work, but avoid questions like, “What is it?” Instead, comment on the use of colors, textures, and how it makes you feel. Display art work on the walls, refrigerator, and other prominent places in the house! Consider giving the kids the chance to “present” their project to you and their parents once it’s complete. Use cut-outs from magazines, scraps of fabric or wallpaper, or objects found on a nature walk. The collage can have a theme, or simply express the artist’s enjoyment of color and texture. Just add paper and glue and let the fun begin. Make flour paste by mixing equal parts of flour and water. Cut or tear strips of newspaper. Soak strips in paper-mache and use to cover whatever form you would like to create. You can crumble recycled, cleaned aluminum foil and make a form to be covered. You can also blow up a balloon and cover it with paper-mache. When dry, pop the balloon and decorate with paint. This can be done to make a piñata, a skull for Halloween or whatever your imagination tells you. Put blobs of different colored paint in the crease of a folded piece of paper. Refold the paper, and push the blob outward with your hand. Open the paper. Do you see any special designs in your accidental painting? Fold a piece of paper in half. Unfold it. Dip a piece of string in paint and place it on the paper. Refold the paper and press down with one hand, as you drag the string from side to side and pull it out with the other hand. Use a new string for each color. Thin out some tempera paint with water. Spoon small puddles of paint onto a piece of paper, then use a straw to blow the puddles around the paper. You can also dip the end of a straw into thick tempera paint, leaving some in the bottom of the straw. Blow the paint onto a sheet of paper, being careful not to breathe in and swallow the paint. Use a different straw for each color. Cut a sheet of paper to fit inside a box (shoe boxes work well with younger children). Place the paper in the bottom of the box. Pour a small amount of several colors of paint onto the paper. Add a marble. Cover the box and shake side to side, back and forth, and up and down. Older kids may want to leave the cover off and watch how the marble leaves tracks through the paint. This is an especially fun project for those rainy or snowy days when going outside isn’t an option. Corn Starch Dough. Combine 1 cup corn starch, 2 cups baking soda, and 1 ¼ cups water in a pot. ADULT ROLE: Stir over low heat until mixture looks like mashed potatoes. Don’t let it stick to the sides. Remove from pot and let cool slightly. Put the blob on a floured surface when cool enough to handle and knead until smooth. Roll a piece of dough into the desired shape. You can draw patterns on the beads with a toothpick. Roll the dough out to the desired thickness. Make a hole through the sides, so the pendant will lie flat. You can also make two side-by-side holes to lace the string through. Dry the beads and pendant in a warm, dry place for several days, or put them on a cookie sheet and have an adult put the pan in a 300-degree oven. Check them every half hour. When dry, you can paint them with acrylic or tempera paint and seal them with a flue glaze (equal parts of white glue and water) or clear nail polish.